Recluse mustangs, red rock goblins and renegade lairs. 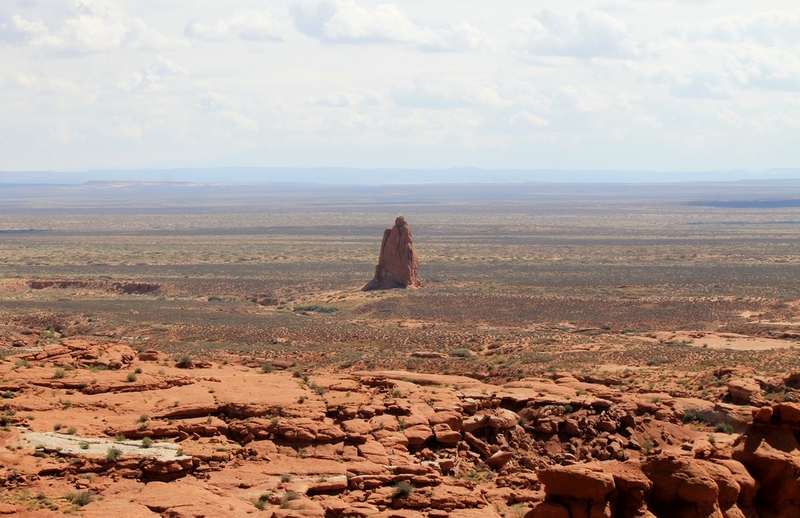 The Robbers' Roost Herd Area spans 265 square miles of the San Rafael Desert, stretching from Sweetwater Reef in southern Emery County to the Dirty Devil River a few miles east of Hanksville. This area takes its name from the deep slot canyons stretching northeastward from the Dirty Devil, used as impenetrable hideouts by late-nineteenth century outlaws -- Butch Cassidy's Wild Bunch being the most legendary. 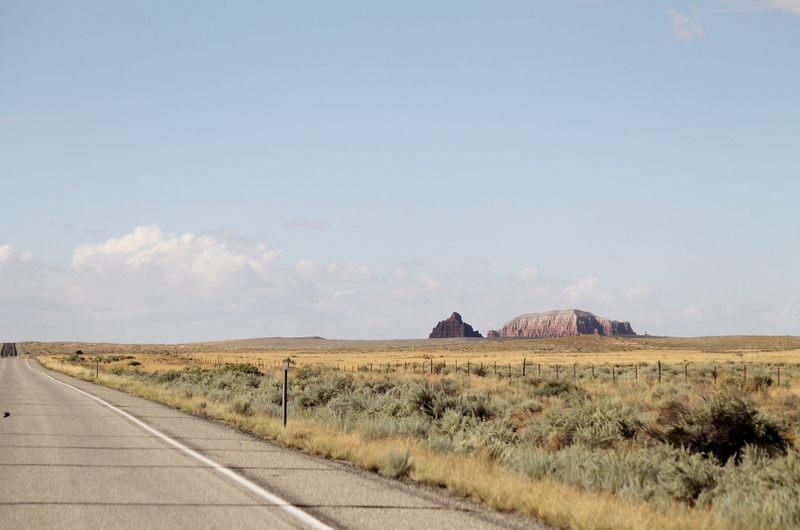 Nestled between Canyonlands and the San Rafael Swell, this region seems generally overlooked as an empty expanse that must simply be driven through on ones journey from tourist attraction A to tourist attraction B. The BLM sign marking the Lower San Rafael Road turnoff, about a half mile south of Goblin Valley State Park along UT-24, suggests nothing interesting for the next 32 miles. It just ain't so. Approaching this turnoff from the north affords a magnificent view of Gilson's Butte, west of the highway. Along the twenty mile stretch to Sweetwater Reef, you'll skirt the erosion fan of Little Flat Top butte as you circumnavigate the western and northern faces of The Big Flat Tops. 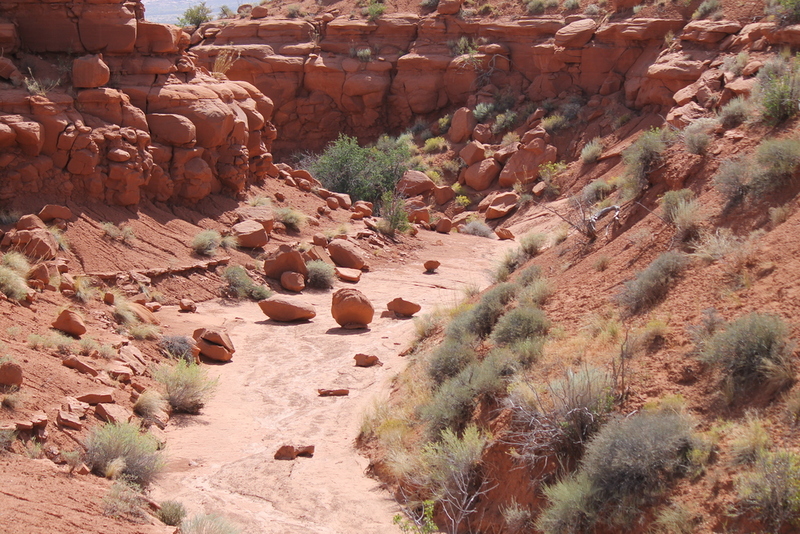 For the adventurous, the northeastern rim of Sweetwater Reef is serrated with a gorgeous network of small canyons, many of which are easily hiked and appreciated from within the crumbling red walls (once you reach them). Green River is a great place to gas up before venturing into this region. 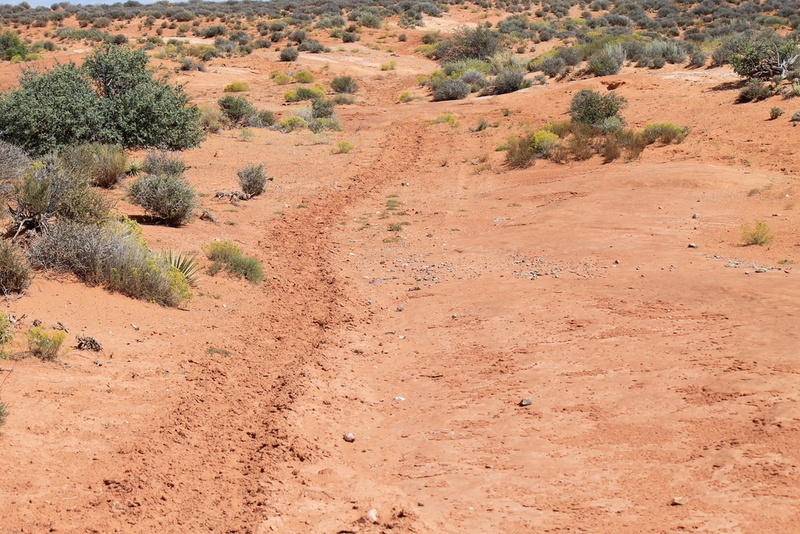 Exit 149 from US-70 to UT-24, toward Hanksville and Goblin Valley State Park, is just over eleven miles west. The paved turnoff to Goblin Valley (Temple Mountain Road) is 24.5 miles down this highway, and the unpaved turnoff onto the Lower San Rafael Road is just 1/2 mile further -- watch for the large BLM sign on the left (east) side of the highway after you pass the Goblin Valley turnoff. The photos below were taken from Lower San Rafael Road, as it runs immediately south of Sweetwater Reef almost exactly twenty miles in from the highway. 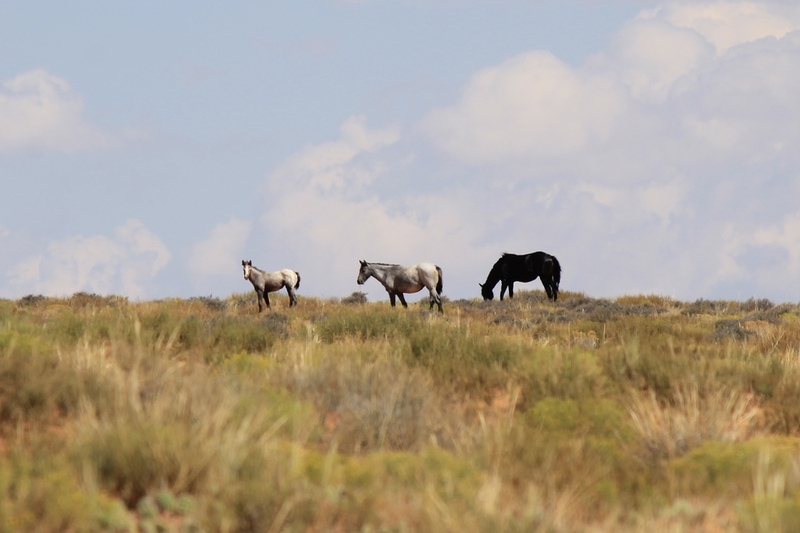 The BLM page for this area suggests this vicinity, but also warns that sightings are unlikely due to the small herd population (perhaps 25 to 50) and the mustangs' preference for the area north of the reef. I must have been lucky on my first visit, but I plan to return for a more thorough exploration of the northern range in the near future. Of course, I'll let you know what I find. You can begin this day-long trip in Green River, following the directions above to first visit the Sweetwater Reef area. Plan on about an hour and 15 minutes to reach this location. Having sighted mustangs here (think positively! ), retrace your route back to UT-24. Turn right onto the highway, exiting left onto Temple Mountain Road just 1/2 mile north. Another left 5.2 miles down this road puts you on the 6.7 mile stretch into Goblin Valley ($7 entrance fee per vehicle). Plan on 50 - 60 minutes drive time from Sweetwater Reef. Once you've had your fill of goblins and hoodoos, head back to Temple Mountain Road and turn left to continue into the Sinbad area of the San Rafael Swell. The pavement ends after just 1.3 miles as it passes through a popular camping area -- be aware that recent weather events may render sections of this road impassable for the family sedan, so proceed with caution. Enjoy the amazing views as you continue along this stretch for the next 10 miles. Plan on about 45 minutes for this leg. Watch for the small BLM sign reading "Interstate 70 →" and follow the arrow, continuing on Temple Mountain Road as it branches northward. Another 11 miles, 30 -40 minutes, brings you to a bend in the road immediately adjacent to US-70. This is prime wild burro territory (see the Sinbad page for more details). Another 1.5 miles takes you to the US-70 entrance, and it's just 30 miles back to Green River. Overall, you'll log at least 150 miles and approximately four hours behind the wheel. Throughout, your closest opportunities for gas, food and water will be either Green River or Hanksville (20 miles south of Lower San Rafael Rd on UT-24). The westward view from the southern stretch of Temple Mountain Road. Having already mentioned it several times above, Goblin Valley State Park is an obvious attraction. 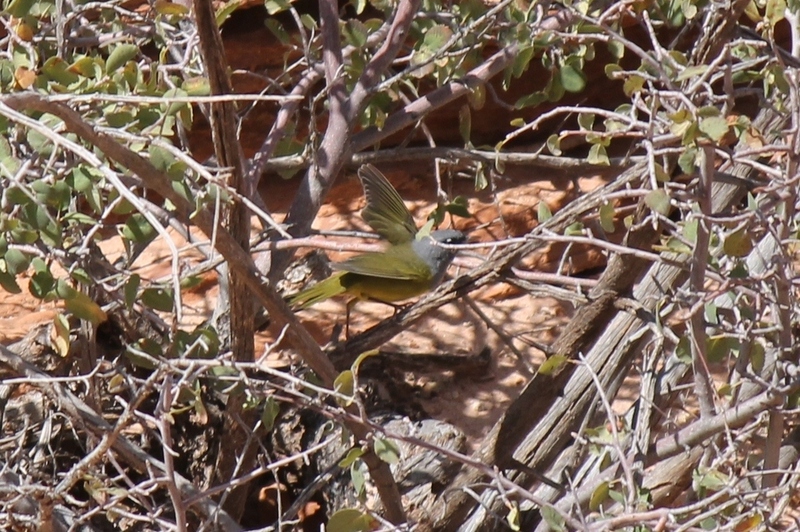 Horseshoe Canyon branches from the northwest corner of Canyonlands National Park. Visitors prepared for the 3.5 mile hike into the canyon (and then back UP) are rewarded with magnificent displays of ancient pictographs. Continue another 9 miles from the Sweetwater Reef location along Lower San Rafael Road, watch for the BLM sign pointing toward "Horseshoe Canyon Trailhead." The parking area is 1.8 miles from this turnoff. Outhouses available. 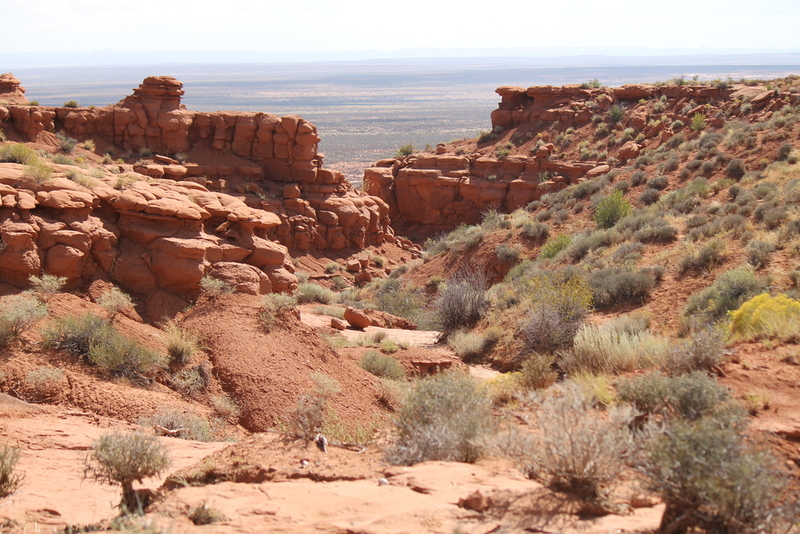 Robbers' Roost Canyon appears to be accessible from Hanksville. I will provide directions after I've had a chance to visit this location myself. 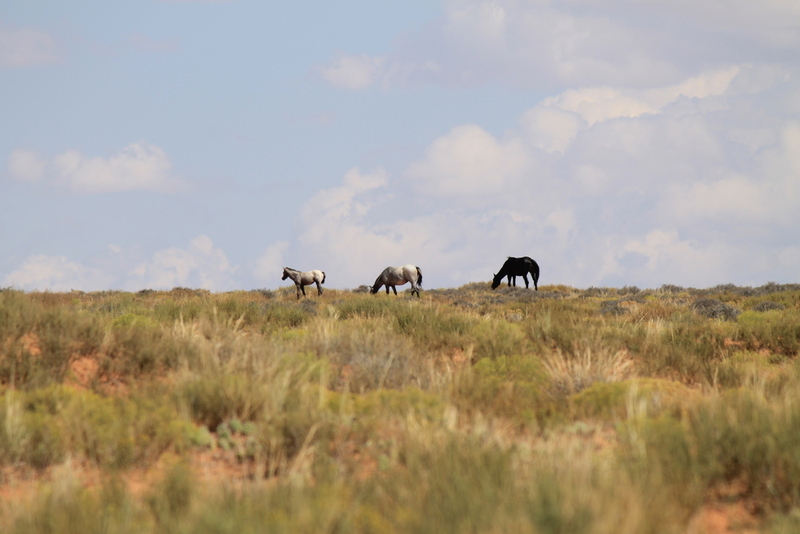 Click here to view the BLM's web page for this herd area.